Cream Violet is also called Pale Violet, but whichever name you prefer, this is a vanilla-colored violet that is quite common right now in mid-spring. Luckily for us it is easy to identify too. Viola striata has 1-inch ivory-white flowers born on long stems (peduncles) that emerge from the leaf axil (the juncture where the leaf meets the stem). The flower stem curves slightly at the top. There are 5 petals on each flower; the two lateral petals are hairy (or bearded!) at the base. The lower petal is purple-striped (hence the species name V. striata) and forms a stubby spur on the back of the flower. The two upper petals are unmarked. 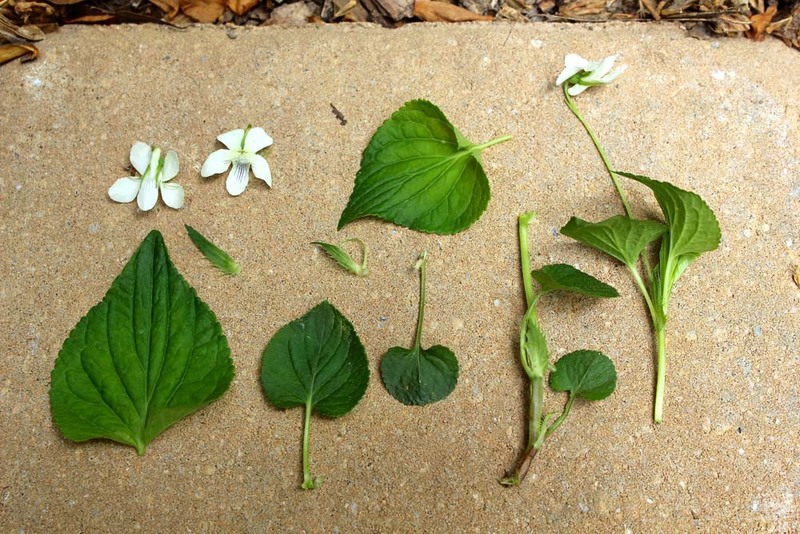 There are 5 green sepals on the back that are narrow and elongated. The long-stemmed leaves are somewhat variable in shape, but they are predominantly heart-shaped (cordate). The smaller leaves at the base of the plant are oval to kidney-shaped (reniform). All have serrated edges. A defining feature of this flower are the very tiny leaves that can be found in the leaf axils. These leaves are called stipules and on pale violet the edges of the stipules look like they have been torn (lacerate). Compare this plant to another white violet that I featured last week, Canada Violet, which has white flowers with yellow centers, narrow stipules with smooth margins (entire), and it grows much taller and leggier than pale violet (up to 14 inches).